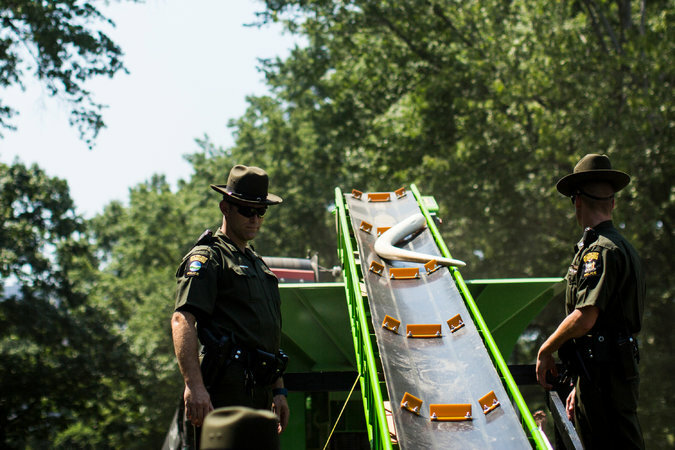 This past week $8 million worth of elephant ivory was destroyed in Central Park. I know some of you own ivory Mah Jongg sets…how do you feel about the destruction of all of this ivory in anticipation of World Ivory Day? How do you feel about the fact that each piece of ivory represents an animal that was slaughtered? Which side of the argument are you on? This is a very interesting article from The New York Times by Hannah Alani. Read on and then let’s hear your thoughts. A loud rumble and giant billows of dust interrupted an otherwise serene day in Central Park on Thursday as hundreds of cream-colored carvings of dragons, Buddhas and horses awaited their public execution. Onlookers waved paper fans reading “Protect their home.” They cheered as sculptures and jewelry made from elephant tusks were carried on a conveyor belt and dropped in a pulverizer. Brian Hackett, an animal-welfare activist from New Jersey, patiently awaited his turn to choose a carving from a table to be destroyed. For him, the mood was solemn. “Every piece, no matter how polished, represents a beautiful animal that was slaughtered,” Mr. Hackett said. 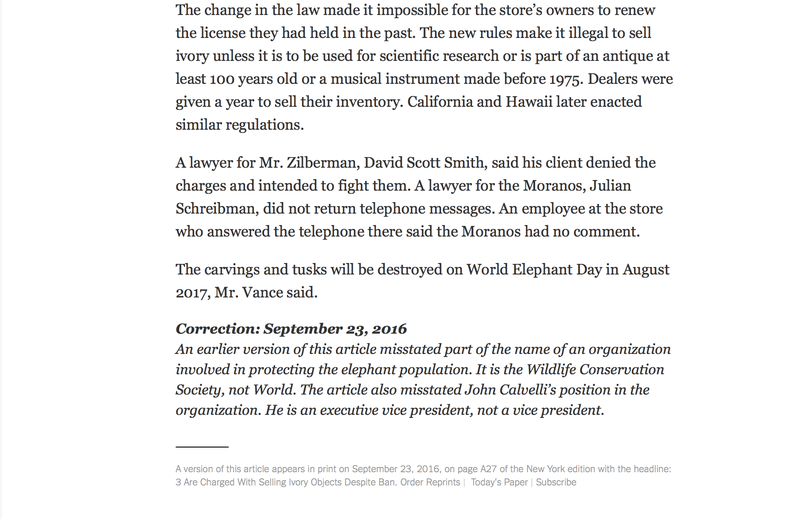 The law helped “spur the world into action for elephants,” said John Calvelli, executive vice president of public affairs at the Wildlife Conservation Society, in a statement. About 96 elephants are killed each day in Africa because of ivory poaching, according to the society and the New York State Department of Environmental Conservation. All of the ivory destroyed on Thursday came from the undercover work of 300 officers during the past three years. 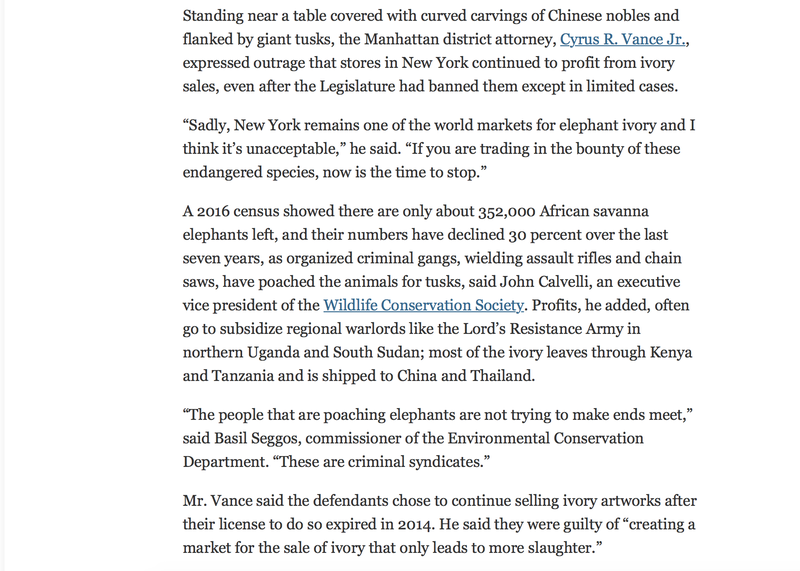 While some of the ivory was found in Buffalo and Albany, 95 percent was found in New York City, said Basil Seggos, the commissioner of the environmental conservation agency. 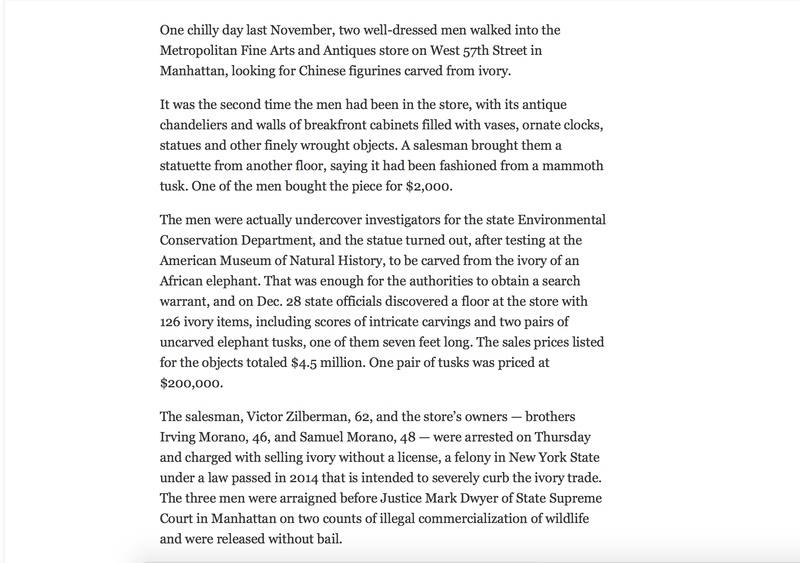 Over half of the ivory was confiscated from Metropolitan Fine Arts and Antiques in Midtown Manhattan, which state officials raided in December 2015. 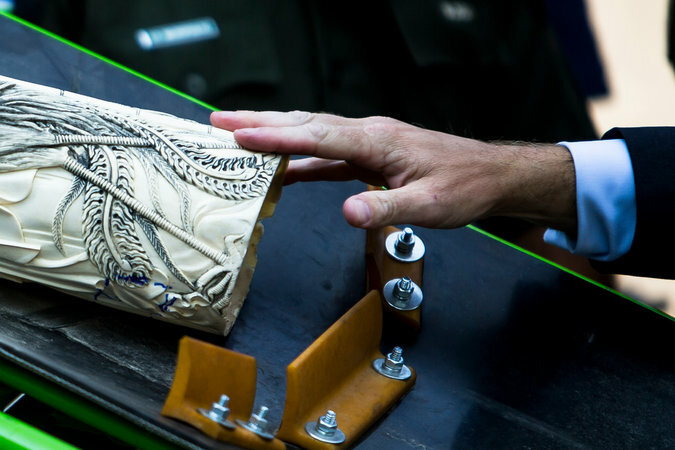 From intricate carvings to a $200,000 pair of tusks, 126 ivory items were at the store. 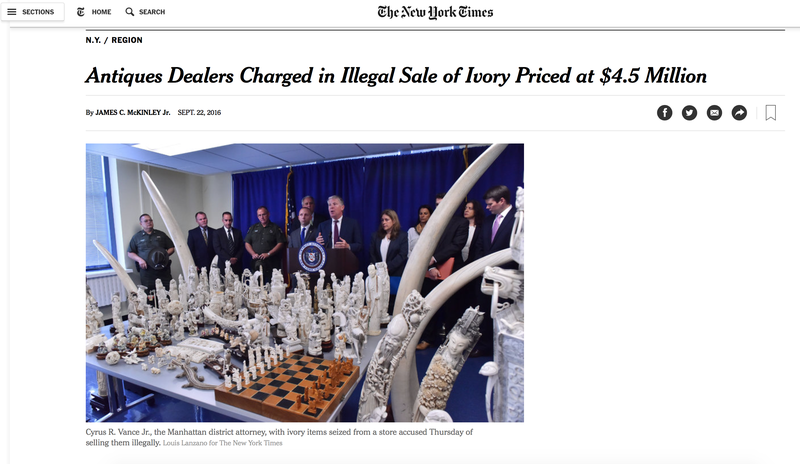 On July 26, the brothers Irving Morano, 47, and Samuel Morano, 49, pleaded guilty to illegally selling and offering for sale more than $4.5 million worth of ivory. As part of their sentence, they forfeited all the seized ivory and an additional 1,657 ivory carvings, all of which were crushed on Thursday. Mary Banerian, 67, who watched the destruction in Central Park, went to Western Africa in the 1980s, when there were fewer regulations, and remembered seeing about 10 elephant tusks for sale there. She said seeing the ivory be rendered valueless on Thursday was “long overdue” and she hoped the destruction would hurt poachers and dealers. “I feel terrible that those elephants had to die to make those items,” she said. 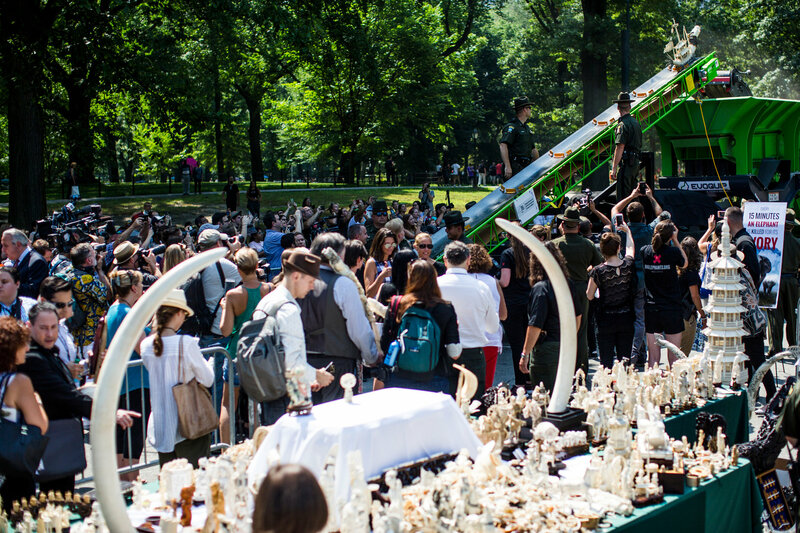 The event was the second Ivory Crush in New York, after one in Times Square in 2015. The first in the nation was in Denver in 2013. “Even with my love of nature, I simply cannot understand what good it does to destroy things that were worked on 300, 400 years ago before conservation was part of daily language,” Ms. Karr said. Sam Wasser, a professor at the University of Washington who has performed forensic analysis on seized ivory for the last 13 years and analyzed the ivory that was crushed, said it was unlikely the destroyed carvings were more than 100 years old. The results are pending. Iris Ho, who is the wildlife campaigns manager at Humane Society International, said the existing law does enough to protect antiques. The law provides exceptions for antiques that are determined to be at least 100 years old with only a small amount of ivory. This entry was posted in Mah Jongg and Me and tagged Central Park, Hannah Alani, Justin Gilliland, mah jongg, mahjong, The New York Times, wildlife Conservation Society, World Ivory Day on August 7, 2017 by Mah Jongg and Me. 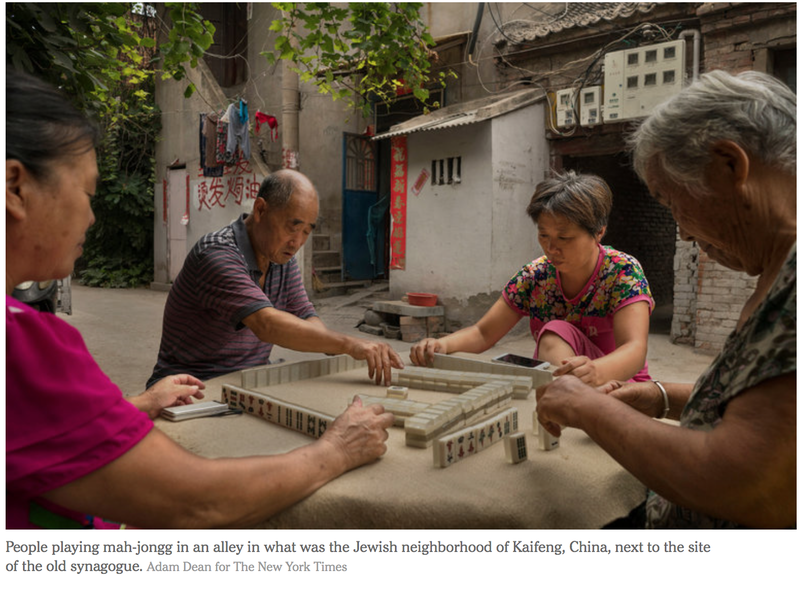 Sunday’s edition of The New York Times had an article about the Jews in China…and guess what the paper zeroed in on… Could these be our relatives?! This entry was posted in Mah Jongg and Me and tagged China, Jews, Kaifeng, mah jongg, mahjong, The New York Times on September 26, 2016 by Mah Jongg and Me. DO YOU HAVE AN IVORY SET? 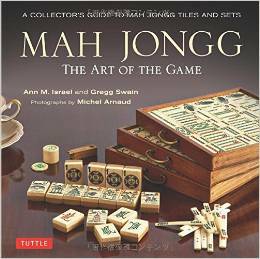 This entry was posted in Mah Jongg and Me and tagged ivory, mah jongg, mahjong, The New York Times on September 25, 2016 by Mah Jongg and Me. 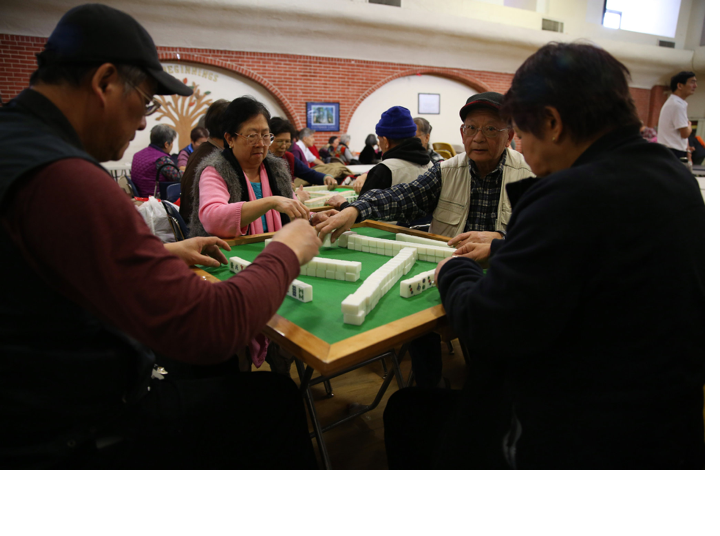 There have been many articles written (and some of them re-posted on this blog) about the benefits of playing Mah Jongg and specifically about increasing brain power and staving off dementia. 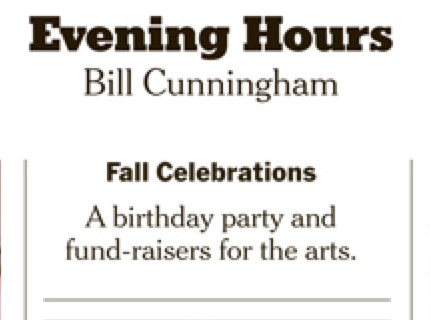 And now Bill Cunningham, in his weekly Evening Hours pictorial column in The New York Times, “documents” this very same thing. Mrs. Koo plays Mah Jongg three times a week (and wins!). My money is on a bet that the celebration of her 110 birthday has a lot to do with her Mah Jongg passion!!! This entry was posted in Mah Jongg and Me and tagged Agnes Hsu-Tang, Bill Cunningham, Evening Hours, Genevieve Young, Juliana Koo, mah jongg, mahjong, Oscar Tang, Shirley Young, The New York Times, V.K. Wellington Koo on October 5, 2015 by Mah Jongg and Me. This entry was posted in Mah Jongg and Me and tagged latte, mah jong, mah jongg, mahjong, The New York Times on August 30, 2015 by Mah Jongg and Me. 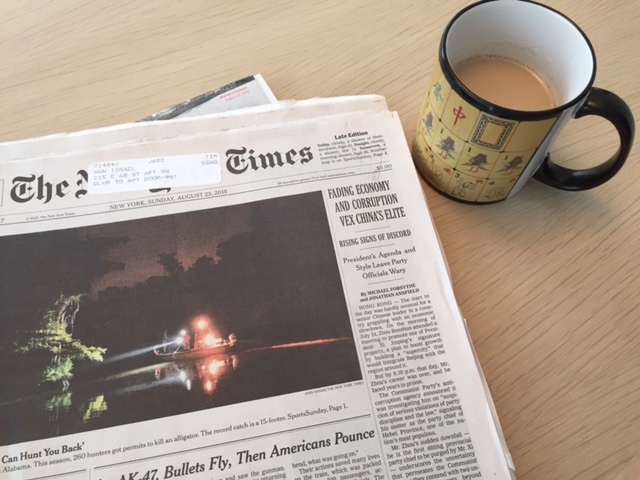 This wonderful photo was on the front page of The New York Times this past Thursday. 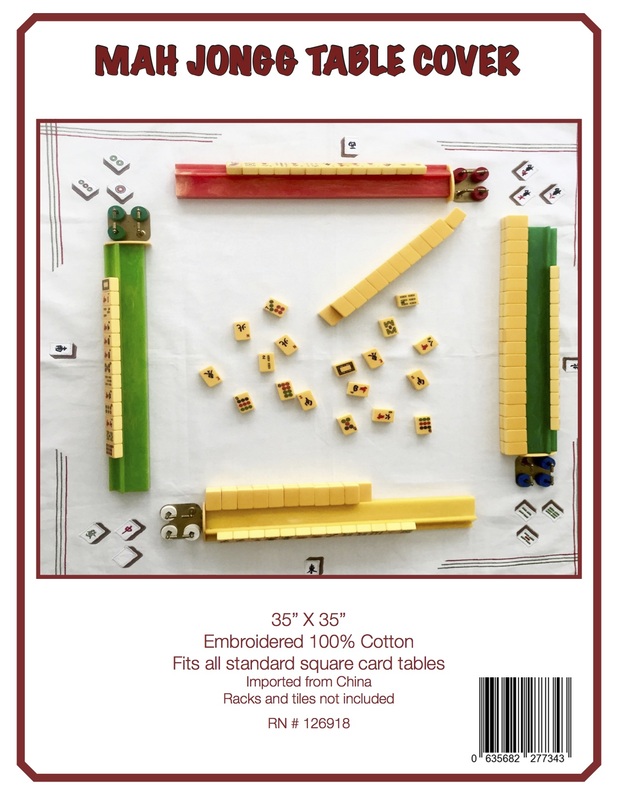 Mah Jongg makes the front page!!! This entry was posted in Mah Jongg and Me and tagged brooklyn, Chinatown, mah jongg, The New York Times on April 18, 2015 by Mah Jongg and Me.